I started playing Chicken Invaders Universe yesterday and here are my first impressions. While i do like the current interface, i think that the previous interface fits Chicken Invaders better. first mission that i played that had a lot of them. Other than that, the game is pretty nice. on a blackscreen, i think all my progress is gone?). Personally, i think that having to pay just to change the color of your ship is not that great idea. I do like the fact that you can upgrade your ship though. Also, maybe let the players set their name when they first open up the game? So overall, Chicken Invaders Universe is going in a really good direction. All these changes make the game completely fresh. What else can i say? Good luck! They made hardest a bit impossible. I wish they can fix it. 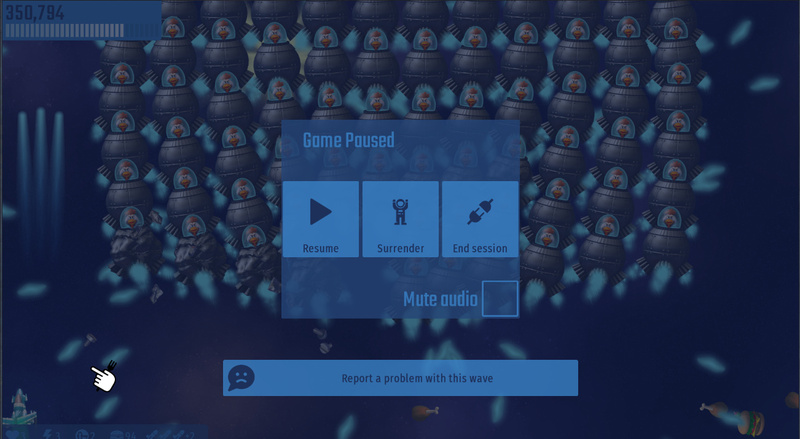 Well, using the rockets is a workaround, but what if you don’t have them? Honestly, it costs more than your gains… So dont play in that difficulty. Sure but, the previous waves were really easy, and then one of these harder waves came out of nowhere. I don’t think it should be like that. The easy waves shouldn’t be next to the harder ones. When i see three ring circus level with the UFO chickens shooting eggs along with the chickenauts atacks was awesome. I even got laugh at the time. Example: Sometimes, Wave 1 of 100 is too hard and Wave 100 of 100 is too easy. Tell me about it! Those enemies, topped off with the Chickenauts, are PURE MADNESS. I met the Henterprise (final boss from CI5) in the weekly challenge, it was disappointingly too easy. Although I completed this week’s challenge with 4 lives lost and 1 life remaining, no satellites, no missiles. Theres easy ones and hard ones. Like at Killing Floor 2. Weekly challenges is for everyone. IA is working for fix the problems. Than they will star to balance difficulty etc.